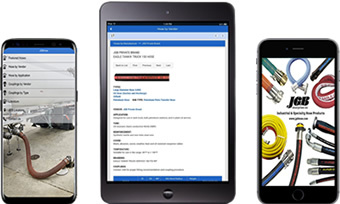 The JGBHose app is your Mobile Industrial and Hydraulic Hose and Fitting Connection! The app developed by JGB Enterprises provides a convenient way for our customers to access our extensive catalog of Hose, Hose Assemblies, & Fittings anytime, anywhere! The JGBHose app offers the customer the ability to view product details on over 5000 different products by market, vendor, application, and type! By using our customized search engine the user can enter specific keywords to locate the products & vendors they are looking for. All literature including, catalogs, brochures, spec sheets and line cards are also available for viewing and download to any mobile device! All of these features are available when & where you need it! View over 5000 featured hoses, couplings, and hose assemblies by market, vendor, application, or type. Preview and download catalogs, brochures, & spec sheets for JGB Enterprises private branded EAGLE products. Request a quote right from your mobile device using our customized “Request A Quote” button on every product detail page. Find the location nearest you, call, email, and get directions right from the application. This app requires a wireless connection to function.